Although this has been a very challenging winter with radical temperature shifts, last summer was the hottest on record in Montreal. Montreal is a city of extremes, shifting from as low as -40°C to +40°C, a major differential and one of the most significant temperature shifts in the world. No wonder our roads are so bumpy with a long cycle of freezing, thawing, and freezing again. If you harken back to last summer, the extreme heat we had was also experienced across most of North America and Europe, with the hottest spot being in Portugal in July, with temperatures above 45°C. Weather experts expect more of the same next summer. 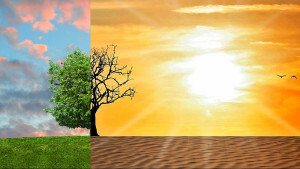 With extreme heat as an apparent new normal, people need to realize how much energy is expended on air conditioning (AC) in our homes, at work, and in public gathering spaces, such as malls and theatres. But it’s important to also realize that AC is actually heating up our whole planet and scientists predict it could add half a degree to global temperatures by 2050. As incomes continue to rise in Asia and Latin America, more and more people can now afford AC, which historically has been a luxury in many corners of the world. At current rates, it’s projected that the number of AC units will increase by 250% in the next 30 years. That would mean that all the AC units across the planet would then consume as much energy as all of China does today. In terms of environmental impact, this would mean 82% more greenhouse gases than we produce now, and half a degree could be added to average global temperatures. Note that heat from AC units in cities can add as much as one degree at night. According to the Global Economic Forum, 21% of global electricity demand is now being attributed to AC alone. So it’s an area we can and should target for reductions. One simple way to address this could be to raise so-called comfort zones of AC in homes, restaurants and malls by a few degrees from mid- to high-teens (mid-60s in Fahrenheit) to above 20°c (or mid-70s F), so that the electrically-powered units don’t have to work as hard. I’m sure there are a lot of other innovative ways to cut back on AC energy consumption. Last November, a new competition was backed by the government of India, with Richard Branson as the spokesperson. The Global Cooling Prize is a prize for innovation in addressing energy costs related to residential cooling technology design. It offers lots of incentives: $3 million in prize money over the next two years. So clearly, it’s a bigger issue than most of us have probably realized until now. 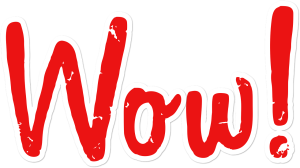 Head’s Blog: Appreciate the WOW Moments! We all live in a digital information and innovation age, and every day we see or consume hundreds, if not thousands, of images and stories through various forms of media. Given that tsunami of information, I sometimes worry that we have all become somewhat immune to wonder and what I like to call WOW moments. That’s when an idea or development stops you in your tracks because it is simply awesome in every respect. Sometimes, we need to stop and think: WOW, that’s truly amazing! That’s happened several times to me in the past few months and I’d like to share a couple of my personal WOW moments. Seven years ago, Quebecer Maurice Desjardins lost his nose, lips, teeth and upper and lower jaw in a horrible hunting accident after being shot in the face. Consequently, he couldn’t breathe, speak or swallow properly. After healing, he was so disfigured he hid away from the world. Last fall, all of that changed with Canada’s first successful face transplant. Montreal plastic surgeon Dr. Daniel Borsuk performed the 17-hour procedure with the support of dozens of medical specialists. Desjardins also had prepared for two full years for his face transplant, including many hours with a psychiatrist to prepare for the possibility that his body would reject the face or the reality of taking on a whole new identity with a new face. Dr. Borsuk and his team also practised for two years. The face is not a single organ, but involves many muscles, nerves, bones and skin. The new face came from a brain-dead man whose blood-type, skin tone and facial measurements closely matched those of Desjardins and whose family gave permission for the donation after his death. And a few months following the face transplant, things seem to be going well. I find the whole concept to be astounding – in a good way – and clearly life-changing for the recipient, with incredible implications for people in the future who may be injured or disfigured in some way. For me, that was a real WOW moment! Another WOW moment happened for me in December when I watched a segment of the CBS news magazine show 60 Minutes. It profiled Marshall Medoff, an 81-year-old eccentric genius inventor. Inspired by the beauty of his regular visits to a local nature reserve and the constant doom-and-gloom stories about our global environment, Medoff felt compelled to address significant issues harming our natural world. Despite his age and lack of formal science training, Medoff put his personal life on hold and concentrated on finding solutions in a rented garage for some fifteen years. He emerged with piles and piles of papers and hundreds of ideas, many of which he has since patented after seeking support from scientists who helped him move forward. Three of his ideas are particularly notable and he has managed to receive private funding and turn the ideas into reality. First is the development of a completely plant-based sugar that is not harmful to teeth or the human body. Second is the creation of a kind of plant-based plastic that is fully biodegradable, and third is a fully renewable plant-based fuel that can power vehicles and heat homes. Each of Medoff’s initiatives has the capacity to address major environmental issues that threaten our sensitive global environment. Despite his lack of training, his ideas have developed into reality and the board of his company, XYLECO, is now populated by notable scientists and inventors. Amazing. Another WOW moment! One of my favourite things to do when I have free time is visit museums or art galleries. When I travel, I visit them pretty much everywhere I go, and there’s often a crowd. So why are so many people drawn to art? I’ve always been impressed by the creativity of gifted artists and the unique perspectives these talented people are able to represent through their work with different mediums – drawing, painting, sculpture and others. Great artists are actually able to create a wow effect, which forces you to stop, think, and wonder how the artist developed such a different idea or perspective. In addition, artists find special ways to make a statement on social issues or controversial topics. The fact that art frequently challenges us is very healthy. Think of the Vietnam Memorial in Washington, DC, as an example of art that challenges, provokes and engages. It was considered very controversial when it was installed in the early 1980s. Its creator was Maya Lin, a 21-year-old art student at Yale University, and her design was chosen in a national competition that included 1,400 entries. To symbolize the impact of war, she chose to literally cut into the earth. She created a long black granite wall and a journey for the viewer from one end of the wall to the other – an intimate place to see the engraved names of the 58,000 soldiers who lost their lives. Some traditionalists wanted a more “heroic sculpture,” and some initially referred to the wall as an insulting “scar in the earth.” Yet, nearly 40 years later, the abstraction and striking symbolism of Maya Lin’s Vietnam Wall has actually made it one of Washington’s most visited and memorable sites. Art not only challenges, it also inspires, by evoking a sense of extraordinary beauty. A good example of this would be Monet’s famous Water Lilies or many of the other striking works by the renowned French Impressionist painters. Here at LCC, I am particularly impressed with the talent of so many emerging artists. 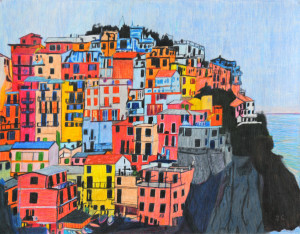 Our gifted art teachers consistently bring out the best in our students. I love looking at the art on our walls in the Junior School and up on the third floor of the Assaly Arts Centre. In fact, sometimes I’m left speechless by what our students produce. That has also been the case in recent years when senior art students have held a special vernissage and exhibition in a professional art gallery in downtown Montreal. I don’t just appreciate art, it also makes me feel better. So I wasn’t surprised to read recently that viewing art is actually good for you. Studies show that slowing down and viewing art is good for both our physical and mental health. It increases two chemicals in our bodies – cortisol and serotonin – hormones that also have a positive effect on us when we exercise. Viewing art can be effective in elevating those hormone levels and diminishing several diseases. A new pilot project has just begun at the Musée des Beaux Arts here in Montreal, where doctors are prescribing museum visits to help diminish a wide variety of health challenges. These are the first legitimate medical prescriptions of museum visits. Every life journey is different and challenging. We all share common bonds by triumphing over our personal challenges. Despite the rosy picture others may project on social media with snapshots of a perfect life, it is actually important to acknowledge reality with young people. Life is challenging and sometimes very hard. Given that we all face obstacles and bumps in the road – often beyond our control – we should help each other by simply being kind. A smile, a word of support, a positive action or gesture can go a long way. 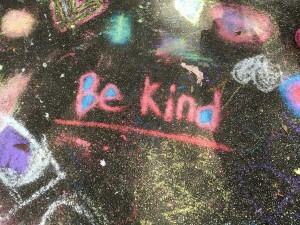 Kindness fuels hope like a bright light that cannot be snuffed out. When some of our Senior School students were in Junior School, our annual theme was Gratitude is the Best Attitude. 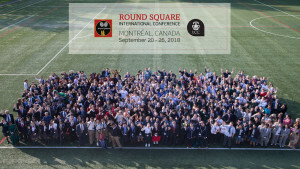 As head of LCC, I am currently feeling very grateful for the excellent Round Square International Conference that we hosted on our campus last week – the largest event we’ve ever held at LCC, with 400 delegates representing 55 schools from 20+ countries. It was the week that the world came to LCC. I’m grateful to our outstanding LCC student leaders. A year ago they chose Bring Your Difference as the conference theme, collaborated and planned for months with two other Canadian host schools, demonstrated a welcoming attitude toward visitors, hosted students in their homes, acted as seminar (Baraza) leaders, performers, and event volunteers. Their warmth, energy and excellence were front and centre. I am grateful to our dedicated faculty, staff and board members, especially Mr. Mark Salkeld, Ms. Gillian Shadley and Ms. Michele Owen. They all provided outstanding leadership. I am grateful to LCC kitchen staff for feeding and watering our delegates with grace and for providing lots of food options for all palates and cultural backgrounds. I am grateful to a maintenance team that supported and cleaned up following multiple special events during the week-long conference. I am grateful to LCC parents who generously hosted 260 students in their homes, as well as parent volunteers who organized a memorable “Montreal Eats” dinner for the adult delegates. I am grateful for the unique experiential learning opportunity held here on our campus, as well as in Old Montreal and at camp in the Eastern Townships, with a diverse group of students. I am grateful for the four high quality keynote speakers who taught, inspired and reminded us about the complexity of difference, and offered important insights and ideas for building more inclusive communities well into the future.